Lent season just started and I want to make sure I post a couple Lent friendly recipes before it ends. If you are Catholic, you cannot eat meat products (poultry, pork, beef) on Friday. However, seafood is allowed which is fine by me since I love seafood. There are plenty of Vietnamese recipes that uses seafood. A lot of soups can be Lent friendly by using seafood and vegetables to make the broth. During my last trip to Vietnam, I stayed mainly in Da Nang, which is located in central Vietnam near Hue and Hoi An. It was my first time ever in central Vietnam and I was ecstatic because I love their cuisine so much. 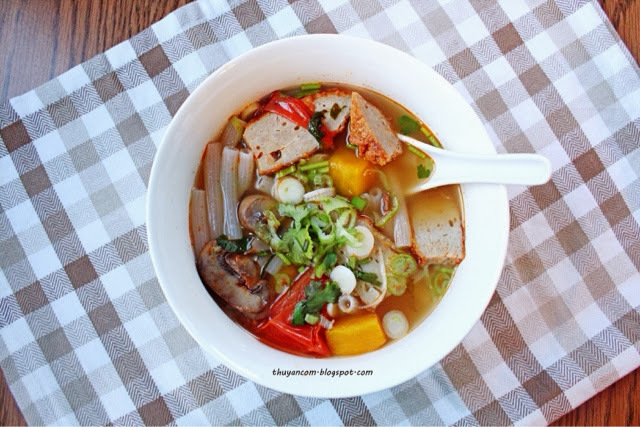 Soups such as Bun Bo Hue and Mi Quang; rice cakes such as Banh Bot Loc and Banh Beo all originated from that region. Every day I got to eat all of my favorite food and got to try new dishes unique to that region, I was in heaven. When I got back to the states, all I want do is cook those dishes over and over again while the flavors and memories are still fresh in my mind! Bun Cha Ca is a noodle soup that really stood out, a specialty of Da Nang, and the first soup I ate when I first arrived. There was a vendor that sells this particular soup at every corner. I’ve had Bun Cha Ca in Saigon before but different from the ones from Da Nang. The ones from Da Nang are sweeter due to a very unique ingredient, bi do (pumpkin, globe squash). The squash also added a beautiful yellow color to the broth. This soup is usually eaten with vermicelli noodle but I used rice macaroni (nui) to change things up a bit. I used dried prawns (tom kho), globe squash, mushroom, daikon, and onions to make the broth. If it weren’t for Lent I would also use pork bones. The globe squash makes the broth very sweet so not much of it is needed. Globe squash is pretty heavy to me so I only add a few pieces here and there to my bowl or else I would get full just eating that alone. I used store brought fish paste and then fried at home. Hope you will enjoy my spin on Da Nang’s Bun Cha Ca! 1. Add the rehydrated prawns into a 6 quart pot and fill with water. Add the daikons and onions. Let pot cook on medium until all the sweetnes and flavor has been extracted. 2. If you are using already fried fish cake, just cut into thick slices for easy eating. If not, fried your fish paste in oil. Heat up plenty of oil in a wok or pan, add the fish cake to the pan and then flatten it with a spatula. Cook both side until golden brown. Remove and let it cool on paper towel. 3. Season your broth with salt and mushroom seasoning(1 tablespoon); continue to let it cook until the the prawns has been completely extracted from flavor, and daikon and onions have become mushy. The best way to tell is to have a bite of your prawns, if it’s soft and flavorless you can discard. Remove the daikon and onions as well. 4. If you do not plan to eat the actual squash/pumpkin and only want to use it to make the broth, add the whole thing to the broth. 5. If you do plan to eat the squash, chop it up for easy eating and add to the broth. Let the squash cook until tender. 6. Add the sliced mushroom to the broth. 7. Heat up some oil in a pan with a little bit of chopped green onions, sauteed the tomatoes with some fish sauce. Add the sauteed tomatoes into the broth. 8. Taste the broth with additional fish sauce and sugar if needed. 9. Prepare vermicelli noodles, green onions/cilantro for garnish. 10. Prepare a bowl of noodle and then add broth and fish cakes.